The Japanese anemones started flowering last week, and at this time of year the flowers are a lovely shade of pink, paling as the summer progresses. Some of the Nigella that seeded itself so wonderfully last autumn has produced the pretty seedheads I have included. 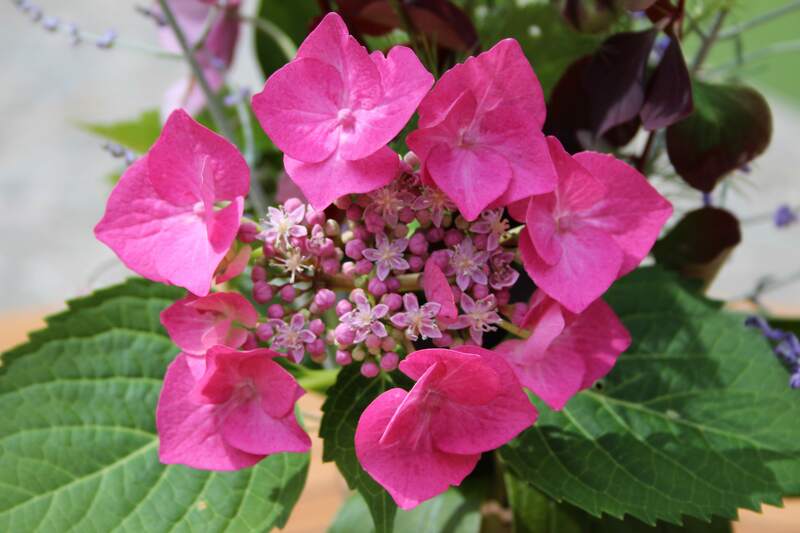 Then there’s my pink Hydrangea; this is the first time it has produced such beautiful flowers. It was blue when it was given to me by a class of students at the end of their course…. about 5 or 6 years ago at least! The Russian Sage has also just begun to flower… I love this plant – its unruly growth and sturdy spears are a focus until late autumn and add a bit more wildness to the rockery. Some wild clover is growing on the edge of the lawn, alive with bees, so just a few flowers were also cut. And I chose the peony foliage to remind me how fabulous the white peonies were in May. I added one red Allium and one sprig of Verbena bonariensis on the way back to the house. So, you are perhaps wondering about the “hate” in the title…. well, the tall red spike with reddish brown leaves is a spiny berberis. I cut some new and particularly sharp shoots that were growing over the pathway and decided to use them in the vase as they are actually quite pretty… but can you see those thorns?! I can almost forgive it when I see how nicely it goes with my lovely Hydrangea! I’ve got a bonus vase this week too… a friend laid these on my doorstep this morning! Thank you Elisabeth! Do you have any plants in your garden that you can forgive for being thorny, untidy or simply thuggish? Pretty arrangement Cathy. I like how your pretty pink hydrangea anchors the other flowers, which seem to be reaching for the sky. I am so glad you said that Susie, as that was exactly what I intended! Thank you! You have made my day! Well I suppose roses come into the category of being spiny but lovely; but the plants I always seem to forget has such sharp thorns and so am constantly being attacked is the lemons! Nice mix of flowers today Cathy. I didn’t realise lemons have thorns! I can cope with rose thorns, but long hard ones like the berberis are probably more painful. One day I will get rid of them all! That berberis is wicked, isn’t it, but what a great idea to use it in a vase, I shall don gauntlets one of these weeks and do the same. I like the airiness of your arrangement very much, and such a lovely gift, that second vase is enchanting. Thanks Janet. I think defiance is sometimes the only way to deal with a problem… especially a thorny one! Summer is so precious! And you have captured all it’s random and sublime beauty! What a lovely comment! Thanks Deb! I wanted to bring indoors all my favourite summery flowers and luckily they went fairly well together! 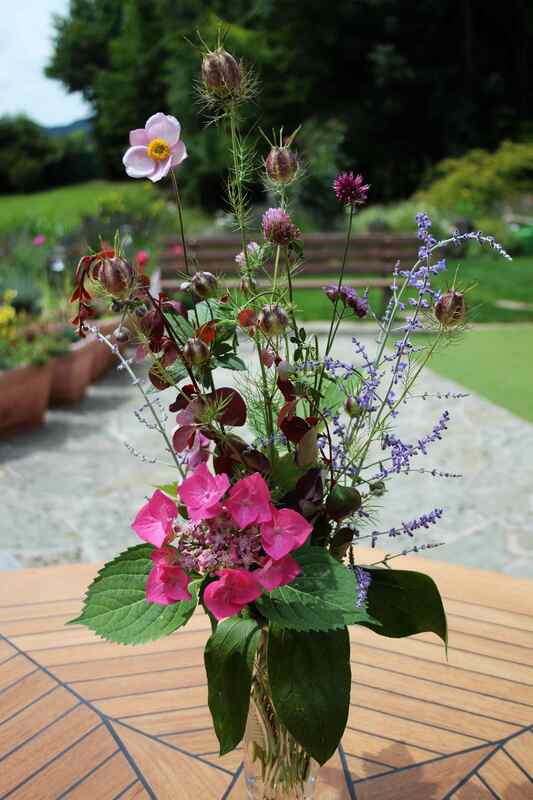 This is a lovely light and airy arrangement – the Nigella seed heads are very architectural. I shall use Nigella seedheads again Christine, as they seem to last forever with or without water. I look forward to having nigella seedheads later in the year – they look great here and the pink hydrangea is much prettier being pink rather than blue, I am sure! 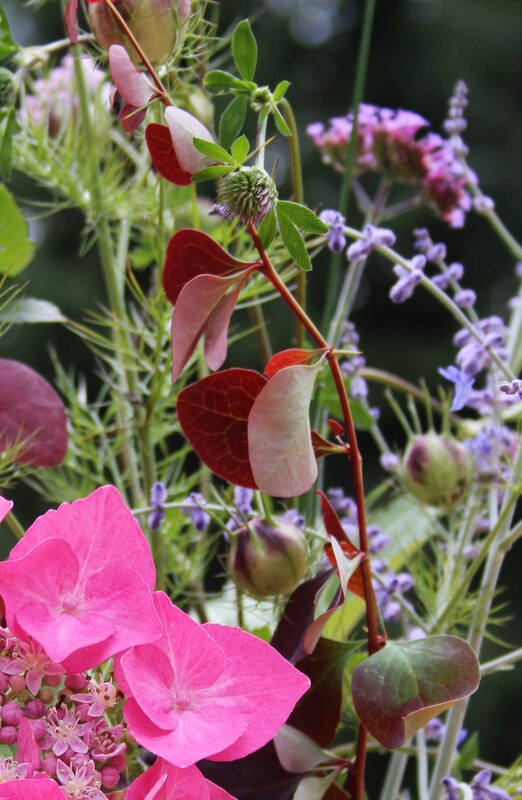 I think I would have removed the berberis if it had been in my garden (and at my My Mum’s it needs to be cut back every time we go) but having braved the thorns it does a brilliant job of pulling together the different elements in your vase, Cathy. 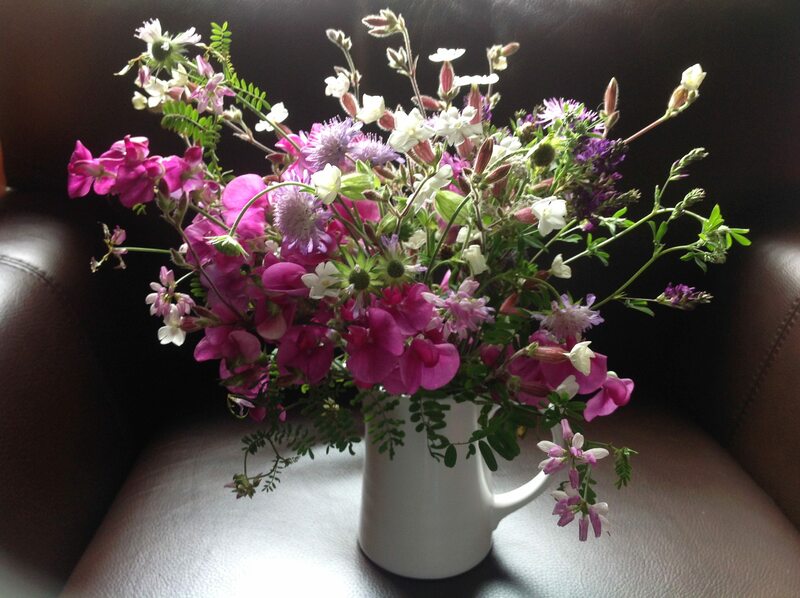 Thanks for joining in, and answering your last question – ‘Herb Robert’ and geraniums of any description, all easy enough to pull out if they outstay their welcome but I love them all anyway! Simply stunning and you captured the picture so well — beautiful photographs! Thanks Kristin. The photo is the trickiest bit!…. Such a pretty mix, Cathy. I’m surprised to see your Japanese anemones blooming so early – ours don’t appear until fall. I recently planted my first Berberis so maybe I’ll face the same challenge you did once it grows big enough to cut. My anemones are always open by August at the latest, but we are a couple of weeks ahead this year. The strange thing is that the German name is Autumn Anemone (Herbstanemonen) so I wonder if this is one effect of global warming…? Cathy I forgive my roses and blackberries….I adore the light and airy nature of your first bouquet…it gives me an idea to be spontaneous and carefree in choosing flowers…look for favorites or what pleases me! I wasn’t sure all the flowers would go together, but just picked them anyway. I think it worked, but will probably not risk it very often again! Thanks Dina – hope your Norwegian summer is bringing you lots of pleasure! Lovely summery flowers in your pretty arrangement Cathy. Berberis is vicious but there is nothing in the garden with thorns as vicious as Pyracantha. It has wonderful berries in Autumn but those thorns are horrendous. I had forgotten Pyracantha has thorns! I have to cut out wild brambles from the edges of the garden regularly and they can be pretty viscious. We also had a stray blackthorn in the garden when we moved here… that was wicked too and put me off picking sloes for good! Two lovely vases full of flowers… there’s definitely a bit of a pink theme going on there. The thorns look really mean, but you’re right – the dark leaves set off the hydrangea flower very nicely. I’m sorry to hear about those nasty thorns, you poor thing. I’ve been stabbed a time or two by thorns, with a jolting pain that shoots straight up my arm. All is forgiven though, when I remind myself that the plant has thorns for protection. It might have otherwise been eaten by a foraging someone in search of a meal. Aren’t you lucky to have them in your vase? Three of our hydrangeas were also blue, but thanks to the acidity in the soil, they’ve all reverted to pink. The blue ones are more of a surprise, aren’t they? I do love the pink as well though, so again, all is forgiven. I’ve been looking forward to your post, and will link back to mine shortly. PS: Elisabeth is a wonderful and talented friend and gardener, too. Thank you Alys. I always think of pink when I think of Hydrangeas, so it’s actually very welcome! Pinks seem to be the predominant colour in the meadows and riverside now, so definitely a summery colour. Lovely. Just thinking about you having a meadow makes me smile. 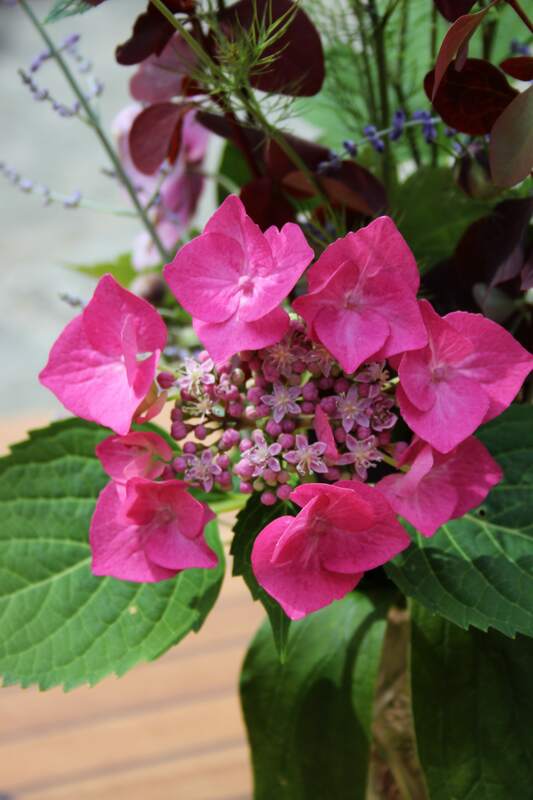 Very beautiful Cathy, I really love the pink hydrangea! Be careful with the thorns! Thanks Michael! When I have to deal with thorns in larger quantities I wear long sleeves and two pairs of gardening gloves, and thick-soled shoes too after getting one in my foot once!! I think this might be my favorite, I pretty much love everything about it! -but I did give the barberries a sideways look since it’s one of those plants I hate to go near because of the thorns. They remind me of the hedge at my parents which always surprised me in a bad way whenever one wandered too close in bare feet. I love thistles. I may be alone in that group, but something about them makes me overlook the weedy pokiness! Berberis was in lots of hedges in our street when I was a child and I learned to respect it back then! It kept the kids out of neighbouing gardens though! I rather like Teasels… invasive, prickly, but beautiful… when not in the garden that is! I´d like to call your bouquet as “apart” in a German sense; fein, zurückhaltend, stilvoll. Vielleicht gehören Dornen zu einem Strauß, der zart ist und in/mit Distanz wirkt. That’s a lovely comment Uta, and I think you are right – a thorn in a bunch of pretty flowers can’t stop us enjoying them! You’re Japanese anemone are blooming already? Ours rarely does before September. Nice vase! Thanks Jason. The anemones are definitely a couple of weeks earlier than usual, but they are normally open by the beginning of August. The German name is Autumn anemone though! Gorgeous arrangement! That hydrangea just pops! Thanks Sheryl. I wish Hydrangeas lasted longer in a vase, but I shall dry some again this year for decoration over winter.